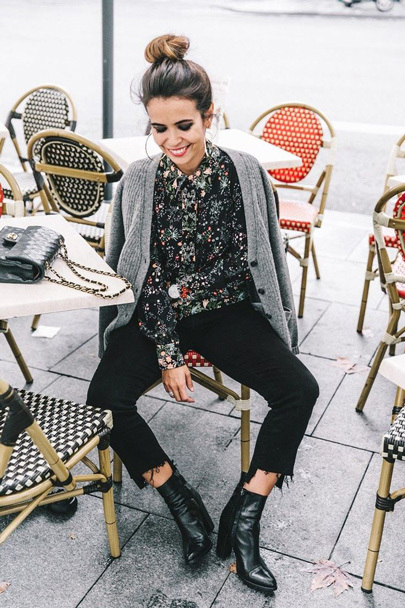 Just in case you forgot: A basic, everyday cardigan can do great stylish wonders, like pull a whole look together. Case in point, above. It also lends just enough warmth, without too much bulk. And I think it adds both polish and a sense of laid-back ease. Inspired, I tracked down some new outfit-improving options to throw over your shoulders right this minute. They include this cashmere Chinti and Parker, this fringed Glamorous, this Chanel-like Miss Selfridge, this shaggy Leith, this cozy Joie, this sequined J.Crew and this game-changing Gucci. The cardigan pictured above is by Levi's and available here. Ooh but who makes the blouse and boots in that photo?? Love them both!